based on the guitar that provides Valensi’s signature sound. Designed for the professional musician, the Elitist line from Epiphone combines over 125 years of instrument building experience and expertise with the finest materials. The results are instruments of impeccable quality and beauty. Nick Valensi, lead guitarist for the Strokes, used to call his customized ’60s Epiphone Riviera “the greatest instrument never made,” but he can’t say that any more. The Epiphone Elitist Nick Valensi Riviera P-94 is part of the prestigious Elitist line of vintage-inspired Epiphones, and the classic semi-hollowbody model is fitted just like Valensi’s, with genuine Gibson P-94 pickups. The patented P-94 is a unique combination that provides the best of both worlds — the hot, thick, punchy sound of a Gibson P-90 in a humbucker-size housing; it uses the same enamel-coated vintage wire and Alnico-V magnets as the P-90 and comes in calibrated neck and bridge models for balanced output. The P-94 has higher output and sustaining qualities than traditional single-coil pickups, giving it plenty of bite when needed, with enough responsiveness to allow subtle nuances for enhanced dynamics. Just like a ’60s Riviera, the Valensi signature model has 5-ply maple top, back, and sides; a one-piece set mahogany neck, 22 frets, a bone nut, tune-o-matic bridge, and trapeze tailpiece. 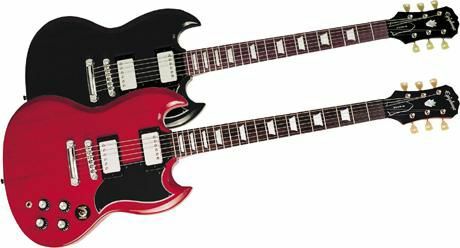 And to show that Gibson stands behind every guitar, all Elitist instruments feature the Epiphone Limited Lifetime Warranty backed by over 100 years of uncompromising Customer Service from Epiphone and Gibson Musical Instruments. End of Epiphone Elitist Nick Valensi Riviera P-94 Electric Guitar Review :: Electric Guitar Review. NextWhy should I consider buying EPIPHONE?